This adrenaline filled sport isn't for the faint-hearted. Bungee jumping is also widely known as the leap of faith. It involves jumping off a raised platform attached to a crane or a cliff. The jumper is connected to a large elastic rope which is tied to his feet. This adrenaline filled activity is enjoyed by both young and old. Bungee jumping is not only limited to tall buildings, bridges or cranes - but in the recent time, they have also been attempted from moving objects such as helicopters. What thrills the heart is not the jump but the rebound movement of the jumper. Even though this activity is deemed dangerous by many, it is, in fact, a safe activity and undergoes a lot of safety checks before being undergone. This is mostly because most bungee jumps are run by trained and experienced professionals who use the best and most secure equipment and maintain very stringent safety procedures. It is often seen that most jumpers back off either due to anxiety or fear, but it overall is a safe and quite a thrilling activity. Bungee jumping wasn't introduced in India and is a recent trend shaking up the whole country. It is comparatively new in the country and is becoming popular amongst the adventure seekers at quite a pace. Due to it being recently introduced it's only at a handful of destinations, Bangalore being one among them. Jumps in Bangalore take place within the city limits making it more accessible thus increasing the count. The most popular bungee jumping attraction is at Ozone Adventures in Bangalore. Bungee jumping being conducted by Ozone Adventures takes place from a height of about 80 feet above the ground. The only difference between bungee jumping in Bangalore and Rishikesh is that there is no fixed platform in Bangalore. The entire equipment for bungee jumping is fastened to a 130 ft high mobile crane. It might not be very safe jumping off a platform being held by a crane. People who belong to the age group of 18 and 60 years can enjoy this adrenaline filled experience. Taking all the factors into consideration the safety of the jumper is given the utmost priority as bungee jumping from cranes is not as relatively safe as jumping from fixed platforms. Location: Ozone Adventures, located on St. Mark's Road, Bangalore. Bungee Jump Height: 25 Meters platform suspended from a 40 m high crane. 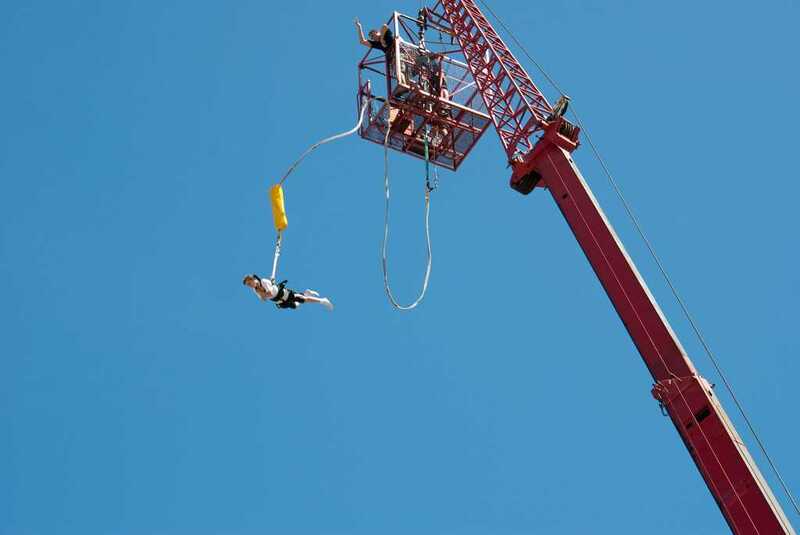 The bungee jump activity located at Bangalore uses the standard elastic rope, which is a type of braided shock cord. It is tied to the ankle of the jumper. The leg harness is joined to the cord tied to the ankle of the jumper, and a body harness is also used for safety purposes and is attached to the jumpsuit. The jumper should be minimum 18 years old. The minimum weight should be around 35kg. The maximum weight of the jumper should be around 110kg. Who Should Avoid Bungee Jumping? 6. If you are pregnant, then it is highly advised that you shouldn't take the jump. Bangalore is well connected to the major cities of India by flight. Bengaluru International Airport is located at around 40 kilometres from the main city limits. A taxi can be hired from the airport which would take you to the main city in around 45 minutes. Bangalore, the IT hub of India, has a wide and well-connected network of roads which connect it to Mumbai, Chennai, Kolkata, Goa and other major cities of India. Buses also ply on a regular basis in between these cities. A wide variety of buses are available to choose from like Volvo, Benz etc. The Karnataka State Transport also has a regular bus service. Yeshwantpur Junction and Bengaluru City Railway Station are the two main important railway stations of Bangalore. Both the railway stations are well connected to the other major cities of India.